I don’t think that West Virginia is at all unique in its haunted lore. Lots of places have them, but the most popular haunted places here in the still-young United States usually tend to be places like hotels, hospitals and jails. Hey! West Virginia has those! There’s the Trans-Allegheny Lunatic Asylum (Weston State Hospital) and the West Virginia State Penitentiary (Moundsville) and the General Lewis Inn, to name a few. Yes, West Virginia has the big, scary places. But among those, are the many, MANY smaller scary places. I’ve joked that we all had a grandma who lived in a haunted house. You know how some grandmas have Buicks? Ours had ornery ghosts living with them. It was just a normal part of life. I’ve heard lots of haunted house stories from my friends and family. My best friend’s grandma lived in an old grand house, long past its prime that still had the carriage house in the back. Several members of her family have stories about that house and most of them are creepy as heck. My mom grew up in a house that apparently had a tendency to scare people who went to the attic at a certain time of day. A friend from high school lived on a private hill and her neighbors had a family cemetery behind their house (not at all rare) and you often heard strange noises coming from that area. I’d like to share one of those crazy tales with you, one my neighbors told me about the old lady’s house across the road from me. I grew up in a mostly rural area, next to a road that featured coal trucks thundering past at reckless speeds, always leaving roadkill right by the fence where my brother and I would play. Across that road, there was a log cabin. HAHAHAHAHA! Ah, no. That’s a vacation home. Let’s try again. 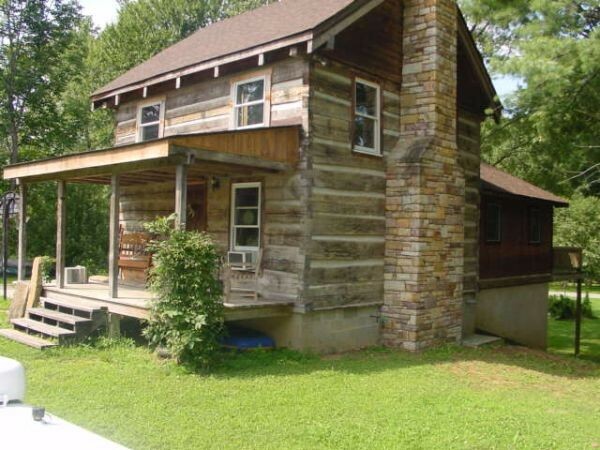 This little was an OLD log cabin. Yeah, okay. I can work with this one. I hadn’t, I told my playmate and she went on to tell me that the old lady had grown up in that house with her parents (believe me, the house looked older than that.) When the old lady was still a child, her father had gotten drunk and thrown her mother down the stairs. The mother’s head had hit the wall near the bottom of the stairs and had broken open, leaving a large spot of blood and gore on the wall. According to my playmate, though they washed the spot and even painted over it through the years, the spot remained. Nobody wanted the house. They couldn’t sell it because, according to the tale, the spot was visible as soon as you walk through the front door. That was why the old lady stayed there. Nobody else could bear to look at the spot where her mother had met her violent end. I never did get to look at the inside. I have no idea how much of that tale is true, but it certainly made for an interesting yarn. This is a pretty tame tale, but it is one of many that I heard growing up in West Virginia. I hope that you’ve enjoyed this edition and I hope that it inspires you not only to look up my home state, but your own. What’s the lore of your home place? Next week, we’re going to talk about the beasts of my home state, but don’t expect me to talk about Mothman! There are more interesting monsters in them hills! Lovely spooky post, Somer! That old cabin sounds the perfect setting for a scary film. Thank you, Catherine! That creepy old place would have been great in a scary movie!